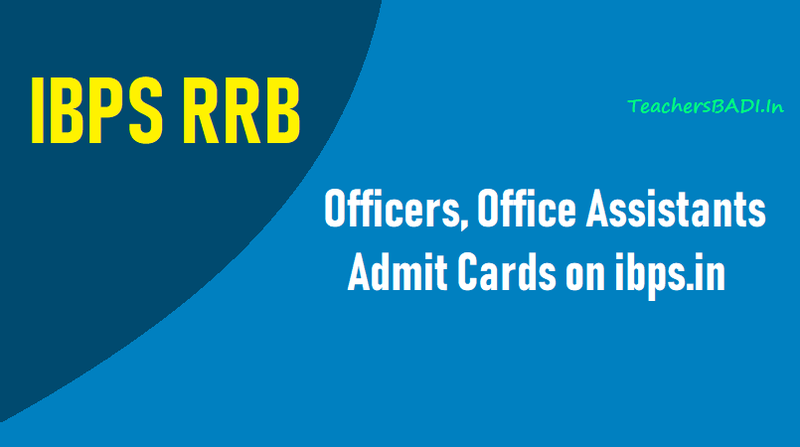 IBPS RRB Officers, Office Assistants Mains 2018 Admit Cards on ibps.in: Admit cards released for Common Recruitment Process for RRBs (RRBs- CRP-VII) for Recruitment of Group "B"-Office Assistant (Multipurpose), Common Recruitment Process for RRBs (RRBs- CRP-VII) for Recruitment of Group "A"-Officers (Scale-I). Steps to download IBPS RRB Office Assistant Main Exam Admit Card? IBPS RRB Prelims Admit Card 2018 for Officer Scale I released, download from ibps.in. Institute of Banking Personnel Selection, IBPS has released the IBPS RRB Officer Scale I Prelims 2018 Admit Cards on ibps.in. Steps to download, important instructions and link provided here. Institute of Banking Personnel Selection, IBPS has released the IBPS RRB Officer Scale I Prelims 2018 Admit Card on the official website. The IBPS RRB Prelims admit card 2018 for Officer Scale is now available for download on ibps.in. Steps to download along with the direct link to the official website is provided below. Candidates who have registered for the preliminary examination are advised to download the IBPS RRB admit cards at the earliest from ibps.in. Please be notified that the admit card would have important information like the date of the examination as well as the examination centre allotted to the candidate. Also, remember that the slots for signature and thumb impression have to be filled in front of the invigilator at the examination hall. Steps are provided below. Step 1: Go to the official website ibps.in and click on the link for IBPS RRB Officer Scale I Prelims 2018 Admit Card Download. Step 2: Candidates can also click on the direct link provided above. Step 3: On the new window that opens, enter your registration number and date of birth to access your account. Step 4: Your admit card would be available for download. Step 5: Download and print the copy of your admit card. Step 6: Candidates are required to carry their admit card’s print out. Candidates are also required to carry a print out of a government id card to the examination centre.All the candidates must go through the instructions given on the admit card. The facility to download the preliminary examination admit card would be available till August 12, 2018. Entry to the examination hall, without the admit card is not allowed. Institute of Banking Personnel Selection, IBPS has released the IBPC RRB Admit Card for IBPS RRB Office Assistant 2018 Prelims examination. The candidates who have applied for the IBPS RRB Office Assistant recruitment 2018 are advised to download the call letters from the official website ibps.in at the earliest. Important instructions along with steps to download the IBPS RRB Office Assistant Prelims 2018 Admit Card are provided below.IBPS would be conducting the RRB Office Assistant preliminary examination in the month of August. Candidates who qualify the preliminary examination would then be required to appear in the main examination. Also, the admit card would have information regarding the examination centre and the date of the preliminary examination. Step 1: Go to the official website ibps.in. Click on the activated link for IBPS RRB Office Assistant Prelims 2018 Admit Card Download. Step 2: Alternatively, click on the link provided here. Step 3: On the new page that opens, enter the registration number and date of birth and submit. Step 4: Click on Download Admit Card link to download and print your call letters. Candidates are advised to carefully go through the instructions printed on the admit card. Also, the hand outs for the examination and instructions have been released. The IBPS RRB office Assistant admit cards for prelims can be downloaded till August 25, 2018.